The Covert Rationing Blog » Blog Archive » The Two Flavors of Covert Rationing: "closer look, however, reveals that these two schools of thought actually have very much in common; certainly enough to explain why Wonkonians and Gekkonians can often be seen forming alliances with one another in their efforts to “reform” the system. First, both schools of thought are based firmly on the notion that the healthcare crisis is caused almost entirely by too much waste and fraud within the healthcare system. While one school tends to blame the waste and fraud on greed and the other on incompetence, the basic problem according to both schools is the inefficient use of resources. DrRich has described the fatal limitations of the “waste and fraud” hypothesis on his website - fundamentally this is the fiction that by increasing inefficiencies we can avoid the need to ration. It is a fatally flawed position. But still, it is attractive to suppose that enough waste exists in the system to make rationing unnecessary. As a direct result of the “waste and fraud” hypothesis, both schools of thought are able to assert that the underlying problem is merely one of how the healthcare system is organized, that is, of who gets to call the shots and which philosophy gets to determine the “rules.”"
The Covert Rationing Blog » Blog Archive » The Two Flavors of Covert Rationing: "The Wonkonians and Gekkonians have one more common feature that deserves prominent mention. In each, the primary solution to the healthcare crisis requires limiting the capacity of doctors to behave as independent agents. In one case this is to be done by regulatory means in order to stifle physician greed; in the other it is to be done by the marketplace in order to eliminate physician inefficiency. But either way the primary goal, the number one priority, is to control physicians’ behavior. To the extent that controlling physicians’ behavior prevents them from being greedy or inefficient, that’s good. But to the extent that controlling their behavior prevents them from fulfilling their defining role as advocates for their patients, that’s bad. Very bad. (We’ll explicitly discuss the importance of the classic doctor-patient relationship, and why we can’t have it anymore under covert rationing, in a future post.)" The Evidence Gap - Health Care That Puts a Computer on the Team - Series - NYTimes.com: "To visit the Marshfield Clinic, a longtime innovator in health information technology, is to glimpse medicine’s digital future. Across the national spectrum of health care politics there is broad agreement that moving patient records into the computer age, the way Marshfield and some other health systems have already done, is essential to improving care and curbing costs. Modern computerized systems have links to online information on best practices, treatment recommendations and harmful drug interactions. The potential benefits include fewer unnecessary tests, reduced medical errors and better care so patients are less likely to require costly treatment in hospitals." Given the fact that the Indian IT industry is so well-developed and that we don't have the burden of old healthcare record storage systems, this is great opportunity for Indian healthcare to leap forward into the new year ! Wi-Fi Keeps Patients and Families Connected: "The availability of such a wireless network comes at a time when people are increasingly connected 24/7, even in a hospital. Georgetown is one of 150 hospitals using CaringBridge, a nonprofit organization started in 1997 that offers a free Web service connecting 20 million families yearly. CaringBridge now has more than 150,000 personalized Web sites for people dealing with major health conditions. According to CaringBridge, the site is not accessible via search engines, and it's the first such free online service for people facing a serious health condition. Georgetown's Kim said the hospital’s childlife department loans out laptops when a family doesn’t have a computer handy. 'There's also one in the family room and one in the playroom,' she said. According to Kim, kids often stay busy playing Webkinz, the virtual online pet game, while parents are working. Kim said the hospital also has Webcams available, allowing bedside videoconferencing as well . " This is a sign of the changing times ! 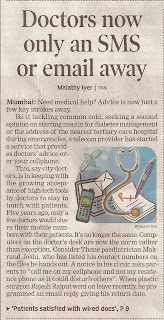 It's early days, but the web will soon become as indispensable to doctors as the telephone is today ! Patient Education | Four Patient Education Fallacies: "Patient education is one of the critical elements of a successful practice, especially today, as more and more patients are having to finance their care out of their own pockets. What's incredible is that effective patient communications is such a small part (or totally absent) from the curricula of today's chiropractic colleges. This critical missing link will continue to sabotage more and more new doctors in today's increasingly competitive marketplace. Best communicators have the best practices. Why not model those who depend upon optimum customer 'education' for their livelihood? Ask any advertising agency or marketing director how to help patients 'get it' and they will reveal two key approaches: impact or repetition, or a combination of both." Who Cares: Sources of Information About Health Care Products and Services: "With so many sources of health information at your fingertips — many of them online — it can be tough to tell fact from fiction, or useful health products and services from those that don’t work or aren’t safe. * find out who you can contact to ask questions, enlist help, or speak up if you think a health product or service isn’t living up to its promises. Just remember: Among the best sources of health information is someone you can meet face-to-face. Talk about all of your health-related decisions with your doctors and other trusted health care providers. " This is a great website which help to protect you from health quackery and fraud ! Internet diagnoses: Trust them or toss them? | e-Patients.net: "The Internet offers immediacy, an advantage at night or on the weekend. It offers anonymity, which is helpful when a symptom seems too embarrassing to discuss with your doctor. It also offers more detailed information than your doctor might have time to provide. That is one of the reasons you shouldn’t use the Internet in a vacuum. Another is that looking symptoms up online can be confusing — and frightening — when you lack medical expertise, since there are seemingly endless possibilities to consider." Like everything else, the net has pros and cons. 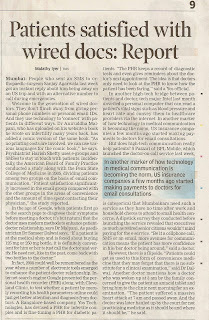 Smart patients know how to use this sensibly - and smart doctors will teach their patients how to use the internet well ! Helping Doctors and Patients Make Sense of Health Statistics This is one of the best articles I have seen, which can help patients make sense of their medical risks. Please read this - and make sure your doctor does too ! The Alternative Route: Hanging Out The Unmentionables For Better Decision Making In Health Information Technology -- Kibbe and McLaughlin 27 (5): w396 -- Health Affairs: "Expert panels and policy analysts have often ignored potential contributions to health information technology (IT) from the Internet and Web-based applications. Perhaps they are among the 'unmentionables' of health IT. Ignoring those unmentionables and relying on established industry experts has left us with a standards process that is complex and burdened by diverse goals, easy for entrenched interests to dominate, and reluctant to deal with potentially disruptive technologies. We need a health IT planning process that is more dynamic in its technological forecasting and inclusive of IT experts from outside the industry." A lot of what we do in delivering healthcare is going to be done online - and the sooner we realise this, the better ! Personal health records - Health Affairs Blog: " You may wonder where the huge numbers of “personal health record” (PHR) companies are in all this. Many of them are still around; some are gaining traction, especially those with a large provider, insurer or employer promoting their adoption. And Microsoft and Google are joining the fray. However, most consumers (other than expectant or new mothers) aren’t that interested in a health record per se. They are interested in dealing with medical bills, or a particular condition, or a particular threat. So much adoption, I believe, will be driven by the kinds of specific applications I mention above. Over time, the PHRs will be able to accept the specific data types generated by the applications, and new applications will generate data that they know the PHRs can handle." The PHR will provide the platform around which healthcare will be provided. Different players will use the data in the PHRs for their own purposes. Thus, patients ( consumers) will use it to get better medical care; doctors will use it to provide better medical care; pharma companies will use it to improve their drug marketing efforts; insurance companies will use it to improve the policies they provide; and governments will use this to improve healthcare in the community; while business people will use PHRs to make money by providing clever services which others want, and will pay for ! Current Health | Services | How It Works: "You are at the center of our practice. See your doctor when you need to. We have as much time as you need. * Schedule appointments or email your doctor anytime. o Become a member today for preferred pricing and priority appointments. * See your doctor anywhere. Come to our office or we’ll come to you. We’ll meet you at your home, office, or any other location within 30 miles of San Francisco. * Pay at the time of your visit. Pay for the services you need. Don’t pay for what you don’t need. Current Health provides you with a simple, prefilled form to submit to your insurance company for reimbursement." It's good to see doctors using technology cleverly to improve the services they provide to their patients. While this is "cutting edge" today, it will become routine in a few years ! Welcome to PharmaSURVEYOR - Beta: "What is a PharmaSURVEYOR Regimen Survey? When you enter your drugs, PharmaSURVEYOR immediately creates a personalized risk assessment for you which shows not only drug-drug interactions but the much more common and often dangerous adverse drug side effects. Presented in a table that is easy to view, search, and sort, your Regimen Survey shows you the big picture including the additive toxicity and combined risks of all your drugs, not only those involved in interactions." Transforming US hospitals - The McKinsey Quarterly - us hospitals compete - Health Care - Hospitals: "US hospitals are under siege. Their operating model once was simple: amass—under one expensive roof—powerful technologies, skilled physicians working at arm’s length, and a volume of patients sufficient to leverage enormous fixed costs. Now, however, intense competition from more focused health care providers, as well as the increasing ability of payers and consumers to obtain information about a hospital’s quality, service, and pricing—in short, about the value it provides—threaten to change the equation." Primary care doctors struggling to survive - Los Angeles Times: "Small general practices afford doctors autonomy to practice medicine as they see fit and can produce strong doctor-patient bonds. But these physicians have little or no clout to leverage better payments with insurers; they have no economy of scale, which makes overhead more burdensome. 'It's very difficult, even in rich neighborhoods like Beverly Hills, to set up a solo practice,' said Richard Scheffler, an economist at UC Berkeley. 'The doctor has to pay rent, a nurse, have a bookkeeper, billing systems, computers. All of those fixed costs are very, very hard for a solo practitioner to have and survive.'" Insurer Offers Option for Surgery in India - NYTimes.com: "The health insurer Wellpoint is testing a new program that gives covered patients the option of going to India for elective surgery, with no out-of-pocket medical costs and free travel for both the patient and a companion. The program is being tested at Serigraph, a printing company in Wisconsin whose managers have been looking for ways to curb rising health care costs, said Dr. Razia Hashmi, chief medical officer for national accounts for Anthem Blue Cross and Blue Shield, which is affiliated with Wellpoint." This will force US doctors to become more cost effective ! Looking Under the Hood and Seeing an Incubator - NYTimes.com: "The heat source is a pair of headlights. A car door alarm signals emergencies. An auto air filter and fan provide climate control. But this contraption has nothing to do with transportation. It is a sturdy, low-cost incubator, designed to keep vulnerable newborns warm during the first fragile days of life. Unlike the notoriously high-maintenance incubators found in neonatal intensive care units in the United States, it is easily repaired, because all of its operational parts come from cars. And while incubators can cost $40,000 or more, this one can be built for less than $1,000." This is a great example of Appropriate Technology. There a lot of these great success stories in India - but they rarely get featured in the NY Times ! Prescription for Change - WSJ.com: "But that is about to change. IT security will eventually meet the expectations of the health-care industry, just as has happened in other sectors, like banking. And when it does, powerful IT networks crisscrossing the globe will change the way much of health care is delivered: Outsourcing and offshoring of medical and nonmedical services will increase, providing more efficient health care at the most cost-effective rates; systems integrations will allow more medical records to be transferred swiftly and securely; efforts to monitor the safety of medicines will gain global access to data; and professionals and patients will find authoritative and up-to-date information on every specialty online." The changes can come from top-down, being mandated by governments or health insurance companies; or they can come from bottom up, as individual doctors and patients can translate the power of IT into better medical care ! My Healthcare is Killing Me! My Healthcare is Killing Me! : "Guess what? You're not alone! And you don't have to be an M.D. or a translator to understand healthcare and get your costs under control. The experts at change:healthcare share what they know about the system and how to survive it. If you are looking to understand the system, save money, and become a smarter healthcare consumer then My Healthcare Is Killing Me is your guide!" This is a free ebook - read it ! The Health Care Blog: Open source is a transparent Trojan horse: "McNealy wove all of these together to hone in on 7 ways that Open Source can help be a foundational element in solving the health care crisis. He gave a fascinating overview of how open source is perfect model for health care. 7. Lowers barriers to exit"
Health Insurance Summit India 2008: "Health Insurance is expected to play a critical role in ensuring healthcare access to people in India . The level of penetration of Health Insurance in India has been on a steady rise; however, it is clear that there is still a long way to go from single digit access figures to meeting global penetration levels. While the Health Insurance industry has benefited from the recent changes in regulations, entry of new players, and improvements in systems and processes , it is important to sustain this growth trajectory. Thus it is critical that the key stakeholders in the health insurance value chain including Regulators, Insurance companies, Third Party Administrators, NGOs and technology companies work in synergy, paving the way for a brighter future ahead." I attended an excellent seminar on 9 Dec organised by the CII on Health Insurance: The Road Ahead. So far, the Indian healthcare sector has been run by doctors, and this has been a cottage industry. It's small, fragmented and disorganised. It is very interesting to see how the entry of the corporate world into this sector has changed the rules of the game. I was impressed by the fact that health insurance companies have realised the importance of going digital - and appreciate the fact that the challenges they are dealing with are enormous. Because of India's huge population, the numbers of transactions are in the millions - but the value of each transaction is much less. Also, since the cost of medical care is low, the potential profit margins are much slimmer which means the operations have to be much more efficient. The first need is to standardise medical records, and since there are no legacy issues, this is a huge opportunity to improve the quality of medical care. IT can be used to improve healthcare - and companies are insisting that doctors and hospitals use ICD-10 coding. While their primary motivation is to improve their claims processing , this will also help to improve the quality of medical care delivered, because it will be much easier to audit this . Electronic transactions are much more frictionless and reduce transaction costs, and it's possible to use the newest web-based technology to make them efficient. One of the comments made was that doctors are very reluctant to participate in providing better data. I wonder why this is so ? Doctors are service providers and are happy to do what needs to be done to provide better care for their patients . Most doctors understand that keeping better medical records and analysing their clinical data will help them to improve the medical care they provide. If it's so obvious, then why don't they cooperate ? The reality is that they have had their fingers burnt when dealing with insurance companies. Many doctors have had bad experiences - delayed pre-authorisation; delayed payments; and refusal to honour claims for the flimsiest clerical reasons ( a list of litanies all US doctors can empathise with , I am sure !) Doctors want to take care of patients - not to deal with paperwork and bureaucratic hassles. Unfortunately, all insurance companies seem to understand is paperwork - and hence the friction. The problem is that patients, who are meant to be the beneficiaries, often end up suffering - and they take out their anger on doctors, who are the "customer face" of the industry, rather than the clueless clerk who is safely ensconced in the TPA's office. Patients expect instant cashless hospitalisation - and since they have an insurance policy, they cannot understand why the doctor refuses to accept this. Unfortunately, the burden of filling out the forms falls on the doctor - and many of whom don't have the staff to do so efficiently. In response to this pressure, doctors are now employing secretaries to fill in the forms - and the additional costs of this paperwork will be passed onto the patient. An enlightened approach would be to provide doctors with practise management software, so that they can run their practises more efficiently; provide better medical care; and also provide the data the insurance company needs, thus creating a win-win situation. This is a huge opportunity for a clever company to provide open source web-based software as a ASP ! The elephant in the room which no one is willing to discuss is the fact that insurance companies have started using their financial clout to start squeezing doctors. They are cutting down on the amounts they are willing to pay for procedures - and doctors are being forced to toe the line, as they cannot afford to lose their patients to other doctors. This has already started to happen for cataract surgery in Bombay - where it's the insurance companies who are now deciding how much a doctor can charge. In a few years, the progressive corporatisation of medicine is going to force Indian doctors to deal with the same problems US doctors are facing today. I must agree that it's doctors who are partly to blame for this. Some doctors are unethical and unscrupulous, and have taken insurance companies for a ride. They overcharge insured patients; fudge paperwork, and it's in order to protect themselves that insurance companies have introduced these safeguards. The trouble is that paperwork has a life of its own, and expands and grows, until it becomes unmanageable ! Also, in order to safeguard themselves from the 5% of doctors who are crooked, the companies end up penalising the other 95% of honest doctors. It's because doctors refuse to police themselves that corporates have been forced to do so. In India, it's really not health insurance at all - it's actually all about illness insurance - about how to manage the financial risk when you need medical care. However, it's hard to sell when you are coercing people to buy policies based on appealing to their fear, because most of us think nothing bad will ever happen to us. We need to focus on wellness , not just illness insurance. The good news is that clever Indian companies are learning from the rest of the world, and are offering new initiatives, which promote wellness and help people to remain healthy. Doctors were conspicuous by their absence in this seminar - and not a single practising doctor ( the ones who have to deal with patients daily ) was invited to be a speaker at the summit. It's a sad fact that most doctors are clueless about these policy decisions which are going to have such a huge impact on their future. Doctors have been sidelined and have become marginalised. Though they are very smart individually , as a group they have no unity, with the result that its very easy to manipulate the profession. The rules as to how healthcare will be delivered are changing - but doctors are not being given the opportunity to offer their insights. What will the impact on patients be ? Most likely, it will be mixed. The good news is that insurance companies will invest in educating patients , who will then hopefully have a bigger say in their own care, because the process will become more transparent. However, the fear is that greedy insurance companies may force the industry to go down the US route , where patients and doctors get squeezed for the sake of profits. Hopefully, companies will take an enlightened approach, and introduce good managerial business practises to ensure transparency and accountability ( both on their own part, and that of doctors). It's unfair for them to expect doctors to be transparent , when they refuse to share their business information, using the pretext that it is confidential . This will benefit doctors , patients as well as health insurance companies , because the entire industry will then grow in a healthy manner. Obama adds health IT to economic stimulus package: "President-elect Barack Obama on Saturday said health information technology will be included in an economic recovery plan that is now being worked out with members of Congress. In his Dec. 6 radio address, Obama said modernizing U.S. hospitals would be part of a major effort to finance an upgrade of the broadband infrastructure of the U.S., which he said has fallen to 15th in the world in its rate of adoption. “We will make sure that every doctor’s office and hospital in this country is using cutting edge technology and electronic medical records so that we can cut red tape, prevent medical mistakes, and help save billions of dollars each year,” Obama said." Incentives and Communications « Patient Centric Healthcare: "Everybody looking at the healthcare system understands that incentives and alignment of goals is a critical component for successful change. * Providers need to be motivated to focus on wellness and prevention. * Individuals need to be motivated to care about the cost of care and to act in a healthy manner. * Pharmacists need to be motivated to take the extra action of moving patients to lower cost agents, resolving administrative edits, and counseling patients. * Hospitals need to be motivated to focus on Six Sigma type process initiatives. * Health Plans need to be motivated to invest in long-term care initiatives that prevent people from getting sick." Carrots work better than sticks ! Patients still have a number of misconceptions about doctors. 4. A doctor's reputation is a good benchmark of his medical skills. Not only do patients have misconceptions about doctors, even doctors harbour misconceptions about themselves ! This list is from Dr. David Newman in his book Hippocrates’ Shadow: Secrets From The House Of Medicine). Physicians don’t know as much as you think they do. Doctors do know that many of the tests, drugs and procedures they order and prescribe either do not work or have not been proven to work. Doctors like ordering tests better than they like listening to you. Haryana woman, 70, becomes world's oldest mom-India-The Times of India: "Rajo Devi, 70, became perhaps the world's oldest mother when she delivered a girl child on November 28, 2008 with the help of in vitro fertilization (IVF) treatment at a Hisar fertility centre. Rajo had entered menopause 20 years ago." Reading an article like this evokes mixed feelings. The good thing is that it highlights how modern IVF technology can help practically anyone to have a baby ! However, it does raise some concerns. For one, no where in the article is it mentioned that donor eggs were used for treatment. I think this omission can mislead readers ; and lull older women into thinking that they can have a baby whenever they like ! Equally worrisome is the fact that after reading such an article, many people start believing that doctors are mad scientists who are now playing God; and that IVF specialists are irresponsible, and will do anything, in order to earn money , or some publicity. This craze to establish world records for " the oldest mother" is ridiculous - and one wonders where it will end ! 75 ? 80 ? I am not happy about the publicity this particular case has attracted. Was this a publicity gimmick ? Is this really being done in the child's best interests ? My fear is that if IVF doctors continue behaving so irresponsibly, society will clamp down on their freedom, and start placing restrictions on what they can do - and what they cannot do. While I am a big believer in patient autonomy and allowing couples to decide what they should do, I also feel that such freedom should be tempered with responsible decision making. Just because it's possible to do something does not mean this should be done ! Wal-Mart Launches E-Health Program - BusinessWeek: "Starting early next year, Wal-Mart Stores (WMT) employees will spend less time filling out forms in the doctor's office. They'll be able to log on to the company's intranet to download and print any medical records their physicians require: allergy information, prescriptions, blood tests, entire health histories if necessary. After nearly a year of pilot tests, the Bentonville (Ark.) retailer made this option available to 1 million U.S. staffers who are eligible for insurance under its benefits enrollment program this fall. Thousands of employees have signed up, making this initiative one of the most ambitious thrusts into digital medical records, or 'e-health,' by any U.S. company. Health 2.0: Patients as Partners - BusinessWeek: "Medicine has always been a top-down affair. Doctors, drug companies, regulators, and researchers are the expert gate-keepers, telling patients what they need to know. Even their own medical records are locked away to protect their privacy. So what would happen if critically ill patients joined together, obtained their personal information, and made it public? Just such a real-world experiment is under way at a Web-based social network started by the company PatientsLikeMe. The two-year-old venture has already signed up 23,000 participants in five chronic-illness categories—amyotrophic lateral sclerosis (ALS), Parkinson's disease, HIV/AIDS, multiple sclerosis, and mood disorders." Via E-Mail, Charity Links Sick People in Distant Areas to Specialists - washingtonpost.com: "The Swinfens run the Swinfen Charitable Trust, a telemedicine charity that uses e-mail to link sick people in poor, remote or dangerous parts of the world with hundreds of medical specialists in some of the world's finest hospitals. Doctors in about 140 hospitals and clinics in 39 nations use the organization to seek help for patients requiring specialized care beyond their capabilities. Through the trust, they can be put in e-mail contact -- often within hours -- with one or more of the 400 specialists who work without pay as part of the trust's network. Doctors in distant areas, including Afghanistan, Antarctica and the Solomon Islands, e-mail photos (many taken with digital cameras supplied by the Swinfens), X-rays, test results and case notes. The information is reviewed by specialists, who respond by e-mail to help make diagnoses and recommend treatments." BioMed Central | Full text | Integrated personal health records: Transformative tools for consumer-centric care: "Integrated personal health records (PHRs) offer significant potential to stimulate transformational changes in health care delivery and self-care by patients. In 2006, an invitational roundtable sponsored by Kaiser Permanente Institute, the American Medical Informatics Association, and the Agency for Healthcare Research and Quality was held to identify the transformative potential of PHRs, as well as barriers to realizing this potential and a framework for action to move them closer to the health care mainstream. This paper highlights and builds on the insights shared during the roundtable." Trend: Physician online consult volume growing - FierceHealthIT: " As we've reported for more than a year, online physician consults via the internet (sometimes known as 'e-visits') are growing more popular over time. While some physicians are leery of conducting patient check-ins online, as they're concerned they'll miss a critical detail, others believe that such visits are fine for patients with minor ailments. In any event, about one-third of e-consults end with the doctor asking the patient to come in for a face-to-face visit, according to e-visit technology vendor RelayHealth. Insurers like Aetna and Cigna have come on board and begun reimbursing for such visits, making it more tempting for doctors to consider such an approach." AHRQ on chronic care management: healthcare IT lowers costs, improves care: " Healthcare IT can improve the quality of care received by the chronically ill and lower costs, according to a report by the Agency for Healthcare Research and Quality. The report, issued by AHRQ's National Resource Center for Health Information and based on information gathered from AHRQ-funded projects, found that use of healthcare IT in caring for the chronically ill improves patient outcomes." DoD Launches Personal Health Record Pilot - FierceHealthcare: "The Department of Defense (DoD) is pleased to announce the successful launch of MiCare, the Military Health System's prototype personal health record (PHR) at Madigan Army Medical Center (MAMC) in Tacoma, Wa. MiCare is designed to help members of the military and their families more easily and effectively manage their health and wellness, regardless of their location and as they seek care inside and beyond the Military Health System. MiCare developed as a pilot project in partnership with Microsoft Corp. and Google. The project which began in March 2008, focused on incorporating the services and features offered by commercial vendors as a way to expedite the development and expand the capabilities of the military's PHR." Developing a Distributed Electronic Health-Record Store for India: " The DIGHT project is addressing the problem of building a scalable and highly available information store for the Electronic Health Records (EHRs) of the over one billion citizens of India. The DIGHT (Distributed Information store for Global Healthcare Technology) project is addressing the challenges of building a scalable and highly reliable information store for EHRs for the citizens of India. The project partners are SICS and the Indian Centre for Development of Advanced Computing (C-DAC)." However, using a new technique called vitrification ( vitros = glass) or flash freezing, we can now reliably freeze eggs as well. - Provision of egg cryostorage for women who wish to pursue their career and want to postpone childbearing. Just like the introduction of birth control helped to revolutionise the way women led their lives by giving them control over when to have children and how many children to have, egg vitrification can allow the new generation of women to pursue their career without compromising their fertility, so that they can have their cake and eat it too ! This can be very empowering ! The Double Standard for Web-Based EMRs: " Why are some physicians still fearful of web-based electronic medical records (EMRs) when most of them are comfortable using web banking and e-commerce sites? Many physicians allow all of their personal financial information to be transmitted over the Internet - including actionable credit card data - but fear using the same methods for managing their patient records. It’s not irrational to be worried about security breaches on the web. But what is the likelihood of compromising patient data through a web-based EMR? Is it a higher or lower risk than web banking or e-commerce? And who would try to hack that information anyways?" Personal Health Records: Widespread adoption of PHRs could save $21 billion a year, according to study - - Medical Economics: "If 80 percent of the population maintained a personal health record – a web-based system that allows patients to view and manage their medical data – it would save the U.S. $21 billion a year on health-care costs, according to a study released earlier this month by a nonprofit research group." Medical Tourism / International PPO | The Lungen Group: " As healthcare in the United States has been changing rapidly over the past few decades, so has the manner in which healthcare has been provided, billed and paid. There is an increasing need to reach beyond our domestic borders to the international community for certain medical procedures, treatment and care at more affordable costs to consumers, benefit plan payers/administrators and re-insurers. The quest for premium quality medical care at lower costs with satisfactory outcomes beyond the United States is already underway and now classified as 'medical tourism.' As more Americans seek care in foreign countries, they also search for destinations that offer the high standards they have come to expect from their domestic healthcare system." So far, most medical tourists travel of their own accord. They are usually self-funded and payout of their own pocket for their medical care. They are often affluential ; and find alternative solutions to their medical problems using the internet. This is why the number of medical tourists has just been a trickle so far. However, once HMOs and insurance companies in the USA start realising the huge financial savings they can achieve by sending their members overseas for elective surgery, this trickle will soon become a flood ! Doctor and Patient - Stories in the Service of Making a Better Doctor - NYTimes.com: "While it has long been understood that clinical practice influenced the youthful writing of doctor-authors like Chekhov and William Carlos Williams, there is now emerging evidence that exposure to literature and writing during residency training can influence how young doctors approach their clinical work. By bringing short stories, poems and essays into hospital wards and medical schools, educators hope to encourage fresh thinking and help break down the wall between doctors and patients. “We’re teaching the humanities to our residents, and it’s making them better doctors,” said Dr. Richard Panush, a rheumatologist and chairman of the department of medicine at Saint Barnabas. The idea of combining literature and medicine — or narrative medicine as it is sometimes called — has played a part in medical education for over 40 years. Studies have repeatedly shown that such literary training can strengthen and support the compassionate instincts of doctors."